Acting Director of the Bureau of Alcohol, Tobacco, Firearms and Explosives (ATF) Kenneth Melson penned a letter to NSSF President Steve Sanetti expressing the Bureau's sincere gratitude to NSSF for its "noteworthy contributions and key involvement in the Don't Lie for the Other Guy program." Acting Director Melson went on to state that "the recent expansion of the program to focus on educating prospective straw purchasers through a variety of public medium, such as billboards, is crucial to the success of this program" and that the campaign "is an important tool for ATF as we pursue our mission of preventing terrorism, reducing violent crime, and protecting the public." 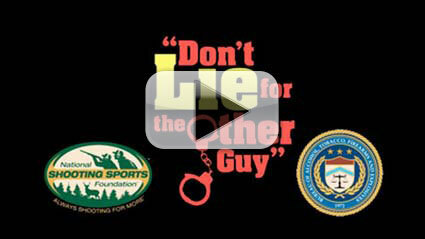 "The Don't Lie for the Other Guy program is vital in educating firearms retailers and their employees on how to recognize and deter the illegal purchase of firearms through straw purchases. This program is an important tool for ATF as we pursue our mission of preventing terrorism, reducing violent crime, and protecting the public." "I believe campaigns like this are important to deter illegal purchases and to help retailers prevent those purchases from happening in the first place." This is certainly a worthwhile endeavor, and I hope that the Justice Department will continue to support the ATF and the Don't Lie for the Other Guy campaign." "Understanding the importance of cooperating with law enforcement, the firearms industry through the NSSF has for nearly a decade partnered with the ATF and the Department of Justice (DOJ) Office of Justice Programs (OJP) to assist law enforcement in educating firearms retailers to be better able to identify and deter illegal straw purchases of firearms and to raise public awareness that straw purchasing is a serious crime. The Don't Lie for the Other Guy program has been welcomed by firearms retailers as a valuable educational tool to better enable them to spot would-be straw purchasers and prevent illegal straw purchases. This ATF/DOJ-OJP/NSSF partnership is a great example of coordination and tangible success on the federal, state, and local levels and with federally licensed firearms retailers throughout the country."